A big thank you to the French cooking blogger “Un Zeste d’Estelle” for this recipe! 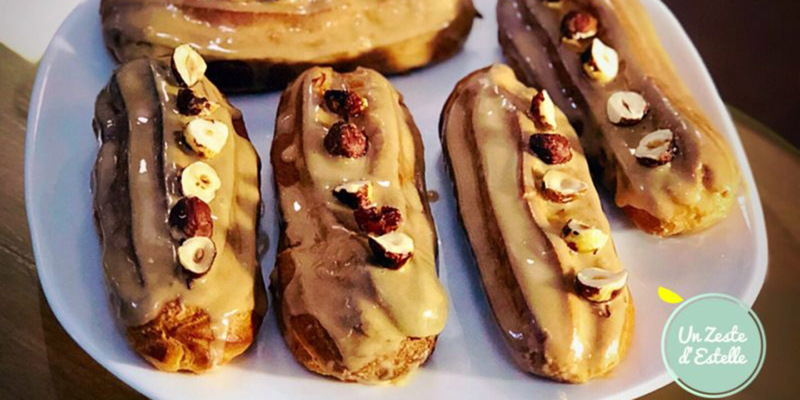 After Estelle couldn’t find a good enough recipe for her to try out with our wonderful ‘Italian Lover‘ coffee beans, she decided to be amazingly creative and create her own lactose-free Eclairs! Read her blog here ! 2. Make a strong cup of Italian Lover coffee, and leave to cool. 4. Beat the egg yolks in a bowl with the rest of the sugar, until the mixture has lightened in colour. Mix in the flan powder or cornstarch and beat more. 5. Once the millk comes to the boil, take off the heat and let the vanilla infuse for a minute. Then pour the milk into the egg mixture and whisk briskly. 6. Once incorporated, pour back into the saucepan and cook for 3-4 minutes over medium heat, whisking without stopping. 7. When the mixture becomes smooth, lower the heat and whisk faster for the last 30 seconds. Do not let it boil! Remove from heat. 8. Spread the mixture on a baking try to allow it to cool faster. Cover with cling film, ensuring the plastic wrap touches the custard to prevent a skin from forming. 9. Tip if you’re in a hurry: fill your sink with a very cold water and plunge the base of the dish to cool faster. 10. When the cream is lukewarm, put it in the refrigerator for about 4 hours, to keep it cool. The whole night is even better! 2. Boil the water, margarine, sugar and salt in a saucepan. 3. Once boiled, add the flour all at once and take off the heat. Stir briskly with a wooden spoon. 4. Turn on the heat and let the dough “dry” a little for 3 minutes: The mixture will quickly form a smooth paste that will peel off the sides of the saucepan as you mix it. 5. Place the contents into a bowl, or a food processor if you have one. Add the eggs one at a time, mixing until the dough is smooth and even. 6. Line a baking sheet with parchment paper, and prepare a piping bag with a wide nozzle. Fill with the pastry mix. 7. Pipe a dozen ‘sausages’ using one fluid motion, each about 15cm long. Space each roll at least 2-3cm apart so they do not touch when they expand in the oven. Be careful to not stop when piping, and do a full pastry continuously. 8. Slide the baking tray into the oven and close the door immediately. Wait 10 minutes. 9. Turn down the oven to 170°C and leave for another 25 minutes. Don’t open the oven door! 10. For the last 3 minutes, open the oven door, and leave slightly open with a wooden spoon blocking the door to dry out the eclairs. 11. Once cooked, let the choux’s cool on a rack before filling. 1. Wash your hands well before this stage, if you haven’t done so already! 2. Fill another piping bag with the cooled custard. Make 2 small holes with a knife 2cm from each end of the pastry roll. 3. Insert the nozzle into the pastry and fill up. The choux will expand. 4. Little trick: you will feel when the weight of your choux increases, sign that they are filled. 5. When the cream starts to come out, remove the overflow with a small spatula, put your choux upside down on a rack and move on to the next. 1. In a large bowl, mix the egg white with the icing sugar with the fork until the two are well combined. Add 2 tablespoons of coffee extract and mix again. This results in a thick ‘fondant’; this is okay, otherwise it would flow everywhere. 2. Take a choux, hold it flat, and dip it in the fondant. Turn it over and remove any excess with a spatula. 3. Lay down the choux’s next to each other on a rack or aluminium foil. 4. Finally, add some roasted and caramelized hazelnuts cut in half, pressing them a little into the frosting. 5. Let the eclairs cool in the fridge for a few hours, allowing the icing to cool.